Two hours! Even when I asked the Captain, he was bound by those orders. So I cant blame him. Another day in Starfleet. 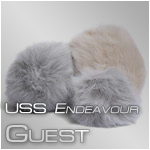 As for the Endeavour herself, she is a gorgeous ship, hands down the best assignment to date. I feel I am integrating well with the crew, still getting to know names. Another few weeks before I get to see my son. I feel like I have let him down. Tevel would be furious if she was capable of feeling that emotion.